The HAIC (Hellenic Association of Insurance Companies) is analyzing the changes about to be done by the government in order to give the supervision of the insurance companies from the PISC (Private Insurance Supervision Committee) to the Bank of Greece. 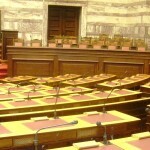 The law has been handed in for approval and will be voted by the Greek parliament shortly. According to the new law, the insurance companies will be obligated to pay 1,5% of each life insurance policy to this joint fund. As far as the portfolios of the closed insurance companies are concerned, the transfer should be completed three months after the order of the president of Bank of Greece (as being the supervisor of the private insurance companies).